In Assam Hundreds of Women offer Eid ‘Namaz’ at Mangaldoi. 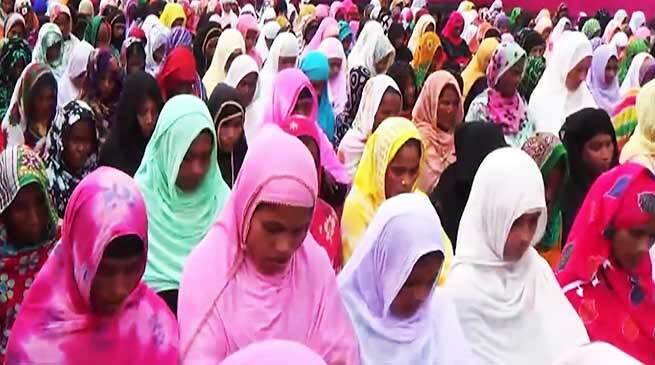 In what seems to be a rare instance, hundreds of women came out in Mangaldoi in Assam and took part in the ‘namaz’ on the occasion of Eid- ul-Fitr on Friday. These women came out in large numbers and offered ‘namaz’ at Bandiya Idgah Maidan of Mangaldoi. Unlike most other places in the state and outside where women are kept away from the public ‘namaz’, the offering of ‘namaz’ by hundreds of women at the place is not a rare incident at Mangaldoi in Assam. According to reports, this has been a tradition of the place since a few years now. Members of the Muslim Community from the region joined the rest of the world in celebrating Eid ul-Fitr, marking the end of Ramadan, the month of fasting. During Eid Namaz this year, the community prayed for peace and unity to return to the state just days after it erupted in protest after the recent incident of mob lynching in Karbi Anglong where two youths from Guwahati were killed on suspicion of being child-lifters.